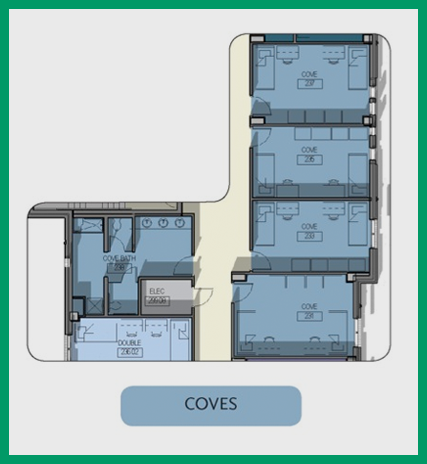 The student rooms in Teal Residential College for Engineering and Computer Science are available in three basic floor plans. Below you will find information on each specific room type. Click here to see a list of room numbers organized by room type (takes you back to the Application page). Cove style rooms are double rooms that share a community style bathroom. Eight people share the community bathroom. Each Bedroom: Two extra-long lofted twin beds, two desks, two chairs, two wardrobes (dimensions: 36"W X 24"D X 72"H), two dressers. Flooring is a wood laminate. 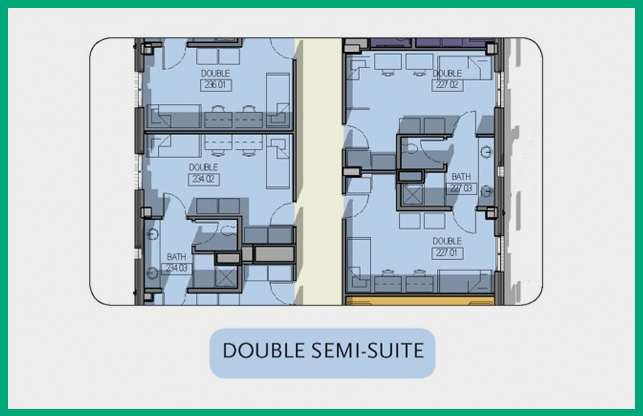 Double Semi-Suite style rooms are double rooms that share a bathroom with another double room. Four people share a bathroom located in the middle of two double suites. Each Bedroom: Two extra-long, lofted twin beds, two desks, two chairs, two dressers, closet space for each student. Flooring is a wood laminate. 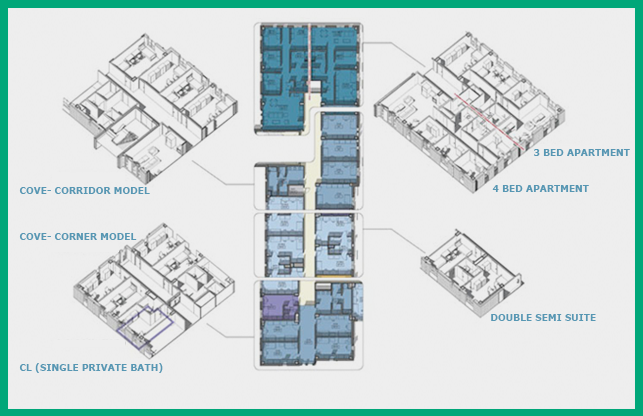 There are 2 and 4-bedroom style apartments to choose from in the Residential College. The 4-bedroom style has 2 bathrooms (and all single rooms). 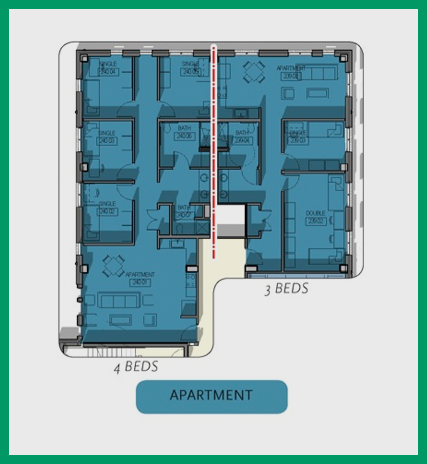 The 2-bedroom style has 1 bathroom (one double room and one single room totaling 3 student spaces). Both styles have kitchens. Each Bedroom: Extra-long, lofted twin bed, desk, chair, wardrobe (dimensions: 36"W X 24"D X 72"H), dresser (double room will double the furniture). Carpet flooring in the bedrooms.